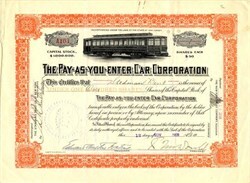 Beautifully engraved certificate from the Pay-as-you-enter Car Corporation issued in 1909. This historic document was printed by Albert B. King and has an ornate border around it with a vignette of an old trolly car. This item has the signatures of the Company's President, Duncan McDonald and Secretary and is over 110 years old. This is the first time we have had this scarce certificate for sale.